As you no doubt know, I am the stay-at-home mother of a two-year-old, Theo. This lifestyle offers many advantages–one of which is having the time to go to Disneyland frequently and blog about it. However, there are some drawbacks, like being limited by the rides only 2-year-olds can go on. And outside of Disneyland, motherhood can become rather monotonous. For social activities, one can join a mom’s group. 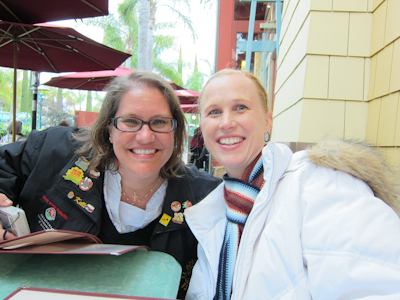 I happen to really like mine–the Gen X Moms of North OC. We’re all moms born in Generation X (1965-1980) and we have kids roughly the same age. The best thing about a mom’s group, other than that I have something to do with my time and my kid gets to play with someone other than me and the television, is that they have Mom’s Night Out events. 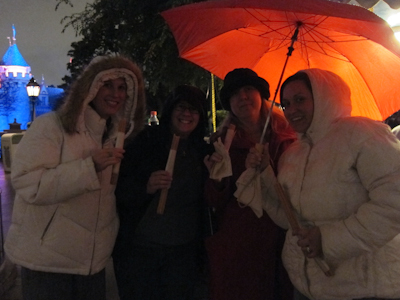 MNO are as they sound–leave the kids at home, moms get together on their own and have a good time. 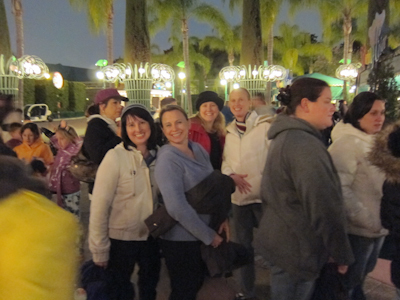 Our latest MNO was at Disneyland. 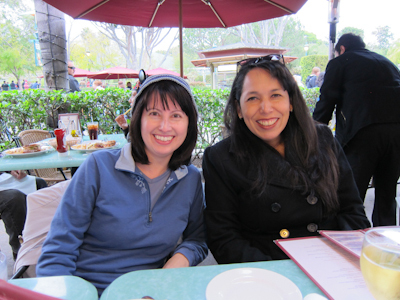 We met at La Brea Bakery in Downtown Disney for dinner. Well, for dinner, and for the people who didn’t want to park in the garage, so they could get their Downtown Disney parking validated. 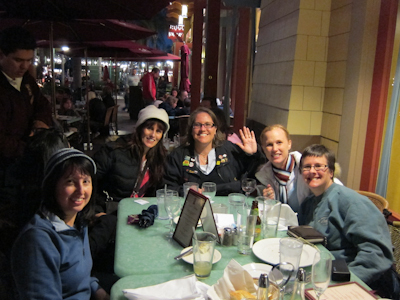 Clockwise starting at 9:00, this is Monica, Ruth, Renay, Kelli (a repeat MYWTMouseketeer), Kristin, and me. The food is actually quite good. I’d never eaten there before. Ruth had been to the park earlier in the day with her kindergartener and passed him off to his daddy to join us. Renay’s husband is a Disney employee so she has a special awesome pass that gets her and three of her closest friends in for free. If I didn’t have an annual pass, Renay would be my closest friend. Actually I just met her last night, which is another fun thing about a mom’s group that keeps changing so you keep meeting nice people. You many remember Kelli from the Churro cart post. Kelli is the mother of Princess Katie, my go-to rental princess when I need to write a post about something involving a little girl, like the Princess Fantasy Faire. Kristin also spent the earlier part of the day at the park with her husband and her three kids. She greeted us with some joyful news–she had a “minor celebrity sighting.” And living in LA, it’s not a huge deal to see celebrities and you try to act all nonchalant or whatever, but Kristin argued that when it comes to, like, celebrities who are actually on reality shows on TLC, that’s different than a regular LA celebrity and you can be all weird and want to get a picture or whatever when you see them. I had to agree when she said that the minor celebrities in question were Kody and Christine from Sister Wives, a TLC reality show about a polygamist family. Kristin was also the one who said, “Is anyone else having another glass of wine?” which prompted me to naturally say “I will if you will,” which lead to a new round for the whole table. 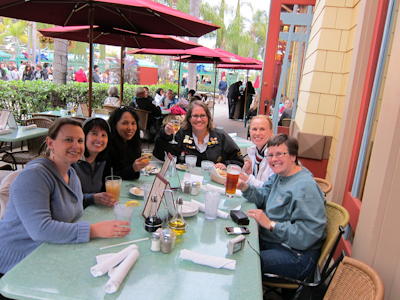 And after we finished up our drinks and paid the bill and got out our rain gear, it was time to head into the parks. Bag check without a stroller! We went on Soarin’ Over California, Space Mountain, Matterhorn, Indiana Jones, and we stood around in some confusion for a while. I’ll post separately about the first two. 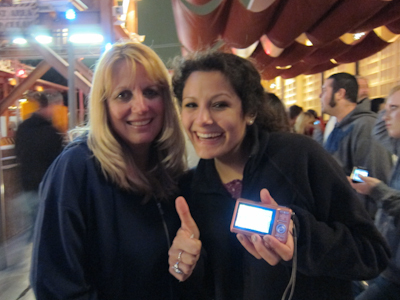 While we were in line for Soarin’, we met two ladies in front of us who had ALSO seen Kody and Christine from Sister Wives. We got to chatting and they actually got a picture, so I took a picture of their picture of Kody and Christine. Obviously it turned out well. They promised to email the actual picture to me, so I hope they do! 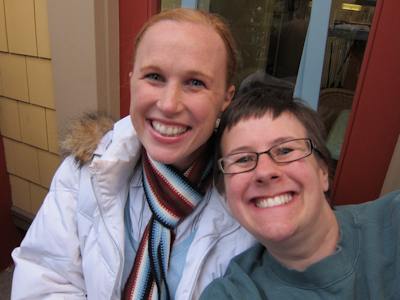 Leave me a comment if you know Janine and Brianne! 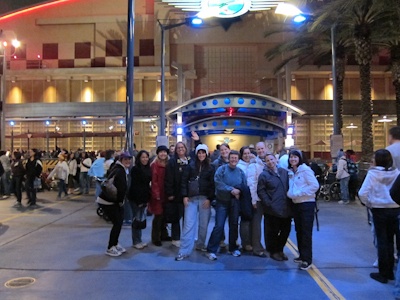 After Soarin’, we headed over to Disneyland. 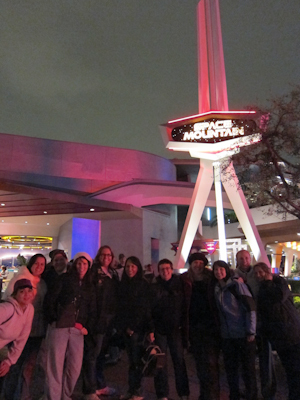 Sadly, as so often happens when a large group attempts to do something at the Mouse, we ended up getting split up, when those of us who usually tote kids around really wanted to go on Space Mountain and the one of us who was pregnant could not. Ah well, you do what you can. I almost panicked because by the time I decided I really needed to eat a churro RIGHT NOW, the carts started closing. Fortunately Main Street still had one open. 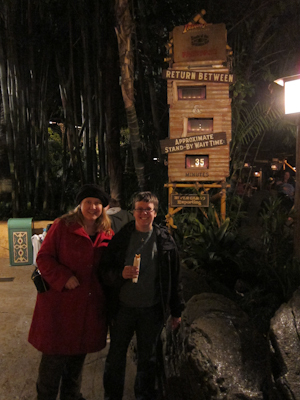 We met at 6:00 and it was quarter to midnight when we got off of Indiana Jones. Poor Kristin was like, “Haunted Mansion? Anyone? Anyone? Jungle Cruise? ANYONE?? ?” but the rest of us decided to call it a night and schedule another mom’s night out another day. All in all, it was awesome. Particularly where we’d pass other mothers dealing with their kids in strollers and we’d look at each other like, “isn’t it nice that our own children are home without us?” Although I did spend much of the night feeling like I left something behind. Like you know that feeling when you walk away from somewhere and you feel a little bit naked because maybe you forgot your purse or your phone, or maybe you left the gas on? I kept having to remind myself that no, I did not accidentally leave Theo alone in the stroller at the bag check, and that I was, in fact, there without my child and was already carrying around everything I needed.